I am often asked what do I do these days – the implication being that the answer is probably ‘nothing at all’ or ‘I am retired’. The reality is that I could not be busier. I have a big new book being published at the end of October, The Cook’s Table, which is very exciting, the culmination of nearly two years’ work, although the content roams over experiences and places from a long time ago to very recent events. I have just received an advance copy and I feel that I am hugging a very special secret. It is a storybook as much as a cookbook and I am impatient to know whether there are still readers out there! Travelling brings new sights, new markets, new smells, new tastes, new understandings and wonderful memories. 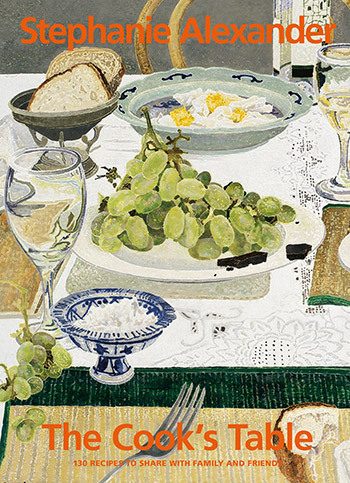 I hasten to add that The Cook’s Table is lavishly illustrated, includes over one hundred new recipes and has a stunning cover taken from a woodblock print by the talented artist Cressida Campbell. Advance orders are being taken via Booktopia and Angus & Robertson.